I am glad my work has caught your eyes and that you want to have beautiful photos of your loved ones. I specialize in families of all kind: expectant families, growing families, crazy-busy families and I offer a true experience that will be uniquely you. Storytelling Family Sessions start at $850, half-day Real Life sessions cost $1,350 with the possibility to order additional à-la-carte prints. You receive ALL low-resolution images ready for online sharing. A third of the grand total and a signed contract are due upon booking to reserve your session. I look forward to creating artwork for you to show off to friends and family and share your story with generations to come. Tax rate of 6% applies. Travel fees may apply. Prices subject to change without notice. "Working with Juliette was such a treat!" Juliette was kind, easy going, and made us feel very comfortable. She was commanding but not in a forceful way. The combination of both portrait and spontaneous shots is perfect! Just what we were looking for. -- Claudina B, Princeton, NJ. Juliette spent several hours photographing an intimate family gathering for my daughter's 100th Day. She was so subtle that everyone seemed to forget they were being photographed and just enjoyed themselves. I love the photos. She captured the day, the joy and the lulls, the smiles and tears, and the details, honestly and beautifully. I will treasure her photos and the memories they hold always. I feel very lucky to have met Juliette as a person and as a photographer. 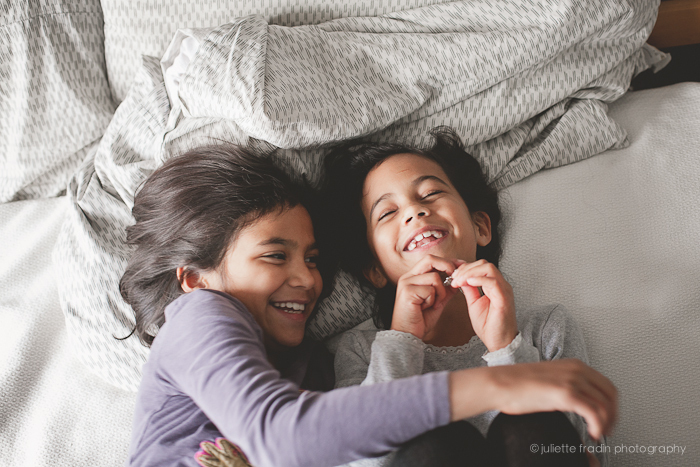 -- Jeeyun K.
We are so lucky to have our family photographed by Juliette. She is a true professional with a great eye and a warm and comforting way with children. Both my girls were at ease with her instantly and even my husband who generally doesn't like being in front of the camera, had a great time. We have some remarkable photos that I will treasure for the rest of my years. As a photographer myself, it is rare to have me in the photo with my family and I am ever so grateful to Juliette for making that happen.